filling up of 732 posts of Fitter, Electrician, AC Mechanic, Welder, Electronic Mechanic, Carpenter, Lineman vacancies at Kanchrapara Workshop and Sealdah Divisions of Eastern Railway. Training Period will be one year. Qualifications required for this Apprentices jobs is Matriculation passed under 10+2 system with minimum 50% aggregate marks and possess ITI certificate course in relevant trade from NCTV recognized institute. Age of the applicant should be between 15 years to 24 years as on 01-07-2017. ITI passed candidates have to submit applications with attested copies of all documents before 07-12-2017. Applications must be reached to Workshop Personnel Officer, Eastern Railway Kanchrapara. Application format and other instructions can be downloaded from the official website of Eastern Railways www.er.indianrailways.gov.in. 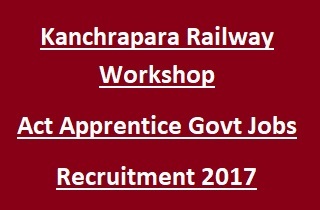 Full details of Kanchrapara Railway Workshop, Sealdah Division Eastern Railways Recruitment Act Apprentices vacancies details, Eligibility criteria, Selection process, Interview Dates, Application Procedure, Training Period and other information are mentioned below. Closing date for submission of applications: 07-12-2017. Total No of Kanchrapara Railway Workshop Eastern Railways Recruitment are 732 posts. a. Kanchrapara Workshop: 206 posts. Matriculation passed under 10+2 system with minimum 50% aggregate marks and possess ITI certificate course in relevant trade from NCTV recognized institute. After the recruitment process, selected candidates for Apprentices Training will get stipend per month as per Govt norms. Age of the candidate should be between 15 years to 24 years as on 01-07-2017. Selection process for the current recruitment is based on Interview. Willing candidates should apply for this Apprentices jobs in prescribed format using the official website www.er.indianrailways.gov.in. Duly attested certificates should be sent before 07-12-2017.